I am thankful for Nathan. Nathan has grown up to be a loving, caring, and passionate individual. I'm not sure how we managed to create such an amazing person, but I am thankful every day we did. I am thankful for Owen. The fact that I am still able to carry a healthy baby is one of my biggest blessings this year. Every kick, tumble, and roll I feel is another day closer to meeting this little miracle. I am thankful for my Angel. Although this precious little baby was only in my womb for a few months, she will forever be part of my heart and part of my family. I am thankful for my new outlook on life. I am thankful for Jonathan. Without such an amazing husband, I would never have gotten through such a tough year. Plus, I wouldn't have been able to make my amazing children! I am thankful for his love. I am thankful for my Family. From my parents to my in-laws to my siblings to my grandmothers, I am so thankful to have been raised in a loving environment. You make me who I am and you are all an inspiration to me. I am thankful for my Friends. I have some of the best friends anyone could ever have. I know they will always be there and that will never change, no matter how long we're apart. I am thankful for the Opportunities given to my family this year. Our move to Nashville has been great and it wouldn't have been possible without my family believing in us. I am thankful to have a place to call home. I am thankful for my Faith. In a year where I could have turned away from it, my faith is now stronger than ever. I trusted God to help me and ended up hearing a new calling. I'm thankful He has kept me on this path. Finally, a few Extras: I'm thankful for my patch of earth, date nights, a caring OB, my work commute, maternity jeans, time with my family, my CYM kids, four-day weekends, hugs for no reason, and wide-open spaces. 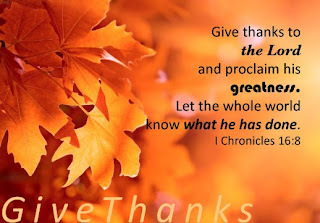 I hope you all have a fantastic Thanksgiving tomorrow and remember to count your blessings, too. No matter what problems you have faced this year, there is always something to be thankful for. Happy Wednesday!